This morning we went to Gatwick Airport to collect our new au pair. Let’s call her “Supergirl” – I think she will need to be. (You don’t have to be a superhero to work here, but it helps…) When we got home, the first thing we did was to show her the important sights of our local area. We introduced her to the lovely lady who runs the Art Gallery, showed her where the station is (for when she needs to escape Suburbia) and took her for lunch at the deli. While we were waiting for our lunch, I suggested that the children might like to interview her for this blogpost. It kept them occupied quite well, and this is what they found out. What is your town called? What number is your house? What is your favourite cafe in Germany? Can you balance a pencil on your nose? Yes, horizontally but not vertically. What is your favourite shop in Germany? I particularly enjoyed Rabbit’s contribution – Let’s just say that balancing pencils on our noses while sitting outside the deli was something of an ice-breaker! This entry was posted in Family life and tagged au pair, Gatwick airport, interview, Supergirl on September 20, 2012 by Hannah. So it is after midnight and I have just sat down for the first bit of time for myself today. Except of course it is technically the next day, so I have actually been through 24 hours with no time to do anything that is on my own personal agenda. And I’m not talking about anything too ambitious here. I just need to respond to a few emails and messages, look into buying trainers for the kids online and do my online food shopping. It seems a little bit sad to call that time for myself… I would also really like to write more. There are a few things the kids have been up to that I would like to blog, if only I could find the time. I’ve been thinking over the last week or two about the fact that I am hopelessly overbooked at the moment, committed to far too many things and I just know that it isn’t going to work. So I know that I need to cancel some things, or I will just be horribly stressed and certainly not a fun mummy. The only problem is what to cancel. There is such a complex net of obligations it is hard to untangle. If I cancel this I will let that person down. If I don’t do that, some of the children will be disappointed, though not all of them. Should I choose on the basis of which I will feel most guilty about not doing, or try to use common sense about what will work best for the majority. Or should I just cancel everything for the sake of my sanity? I’m almost at that point. I’ve been feeling run down and picking up whatever is going around for a week or two, permanently tired and knowing that I’m not doing anything very well because I am trying to do everything. So I know things have to change. And today I’ve been asked for help by someone who really needs it, right now and maybe for some time depending how things pan out. I really want to help and I think I can. Instead of making me panic about having something else to fit in, it is making me realise that sometimes you just have to prioritise what is most important and let other things go. I’m not looking forward to contacting people and letting them know I can’t do the things I said I would. But I feel quite calm about it, and a little bit more in control than I’ve been for a while. And if I manage to help the person I really want to help, it will definitely have been worth it. This entry was posted in Family life and tagged common sense, sanity on September 17, 2012 by Hannah. We took all the children to get their hair cut today, then went shopping for birthday presents for two of their friends. We were home in time for lunch, and then an afternoon of housework, pottering around and playing. Just an ordinary day, but it was good. A little more sorting and decluttering, a couple more bags to the charity shop, a bit of a catch up on laundry. We didn’t really achieve as much as we hoped, but it was enough to feel we were making progress. I think the reason it was a good day was to do with the little things that could be easily overlooked. In fact I’m sure I have overlooked some, but these are the ones that come to mind. Writing that list makes me realise why I didn’t get more housework done today. Why I never get as much done as I imagine I will. And I think I’m fine with that! This entry was posted in Family life and tagged hair cuts, home, playing on September 1, 2012 by Hannah. We spent the weekend at my parents’ house, which is always good but was even better as my brother was there for the middle weekend of his fortnight in the UK (he lives in Australia.) We had seen him on Monday evening last week, but it was good to spend some more time together, and the children had lots of fun with him. We enjoyed the peace and quiet of a weekend in the countryside and away from our to-do lists after such a busy and disrupted few weeks. There was a Latin lesson, a lot of playing with Lego and reading stories, an afternoon playing out on the green with a friend who lives in the village and plenty of watching the Olympics. Back to reality and living in our house while the kitchen work was being finished… It had already taken three weeks and seemed like it would go on forever, but the end was in sight. It was hard work being in the house with the children, so we went out as much as we could. On Monday I took them to the pub, which Suburban Dad found rather amusing. Every Monday in the summer holidays they have children’s craft mornings, and it was a great place to hang out. The younger three played in the sandpit while Owl read a book from cover to cover, giving me time to have a peaceful cup of coffee, then they all had a go at some of the crafts once the crowds around the tables had diminished. We had lunch there (having no kitchen is expensive) and then walked back via the park, stopping for a while in the playground, then getting soaked in a downpour on the way home. On Tuesday we had lunch at the deli across the road (we love it) and then walked to the library and spent a long time there reading while Tiddler slept in the buggy. On Wednesday we went to the local church cafe for lunch (cheaper) and filled in time at the charity shop buying books, then sat outside the Art Gallery with the owner and her son reading the books in the sunshine. When we went home half way through the afternoon the work was finished, which was a big relief. We did some work on our Olympic project which we haven’t really been able to do much of with all the disruption, and Owl in particular was very interested. We all thoroughly enjoyed the first normal day in our own house for a month, and after a quiet morning doing our Olympic project (me and Owl) and playing (the others) we had a good time with our friends who came over for lunch and stayed till after supper (always a pleasure with their three well-behaved helpful children!) I loved cooking on my new induction hob (thank you John Lewis sale) and found the new layout of the kitchen such an improvement that it was a positive pleasure to let Monkey come in and help me to make pudding (his own creation, called Yummy Delight – I believe there’s a blog post to follow…) It was never fun cooking in there before, but now I am going to train up the young chefs till I’m out of a job. I spent the day at the Rosemary Conley Roadshow in Essex, which was a lot of fun, and the children had a wonderful day at the beach with daddy. When they collected me, I was impressed at how sandy and muddy, lolly-juice-sticky and happy they were. The bag of rice cakes and fruit I had sent with them was untouched, and the lolly they were finishing and dripping all over the car was their third one – definitely a daddy day. We arrived home in time to order a delicious Thai meal for supper and share it with my mum, dad and brother who had come down for the evening (my brother is leaving on Sunday.) It was lovely to be able to sit out in the garden at the end of a beautiful sunny day, and good to relax after such a busy week. This entry was posted in Family life, Our family, Outings and tagged beach, family, new kitchen, outings on August 10, 2012 by Hannah. It’s probably going to be hard to explain why this picture means something to me. 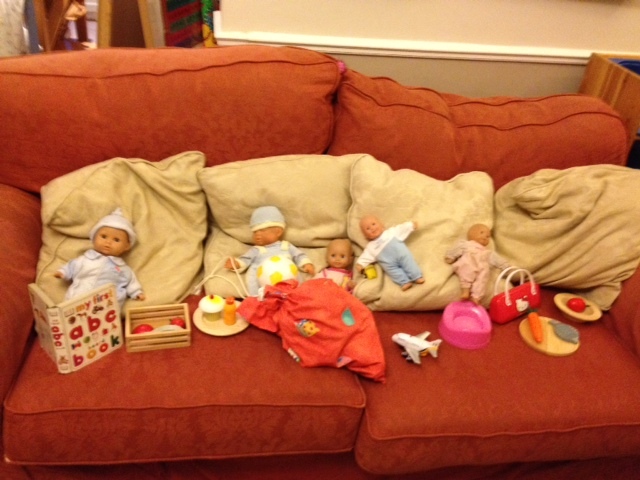 It’s just a load of toys on our saggy old sofa, a scene you might see any day in our house. Quite a nice little arrangement of dolls perhaps, but nothing special. Just one of Monkey’s many creative play scenes which he loves to make. The thought that he put into it, the care he took over the details, his satisfaction when he had achieved what he had set out to do…these are the reasons why this picture sums up childhood for me. Some would say he was “just playing” but I think that is missing the point. It’s easy to be influenced by the world around us, with its constant messages that our children need something more. More structure, more organised activities, more early education, more targets, more testing… Loud and clear we hear it, if you don’t give your children all this, they will fail, they won’t be able to compete, they won’t get in to a good school, college, university, they won’t have a future. How many of us stop to question it? But we should. We should question the idea that play is something to be fitted in only if the work is done. Even though it has become more fashionable to talk about “learning through play” this has made little real difference. Even with the best of intentions, it can be difficult for teachers to plan opportunities for “learning through play” without taking a lot of the joy and creativity out of it. Children learn best when they have the freedom to lead the play themselves, and to develop it as much or as little as they need to at that time. As a home educator it is easy to pick out examples of our children learning through play, and it is very satisfying to be able to report that they have, for example, set up a cafe, written menus, taken orders and worked out the cost and the change. It is tempting to jump up and down with glee, and say “Look, here they are, doing English and Maths, and they think they are just playing!” But if we only recognise that they are learning through play when their play happens to coincide with a neat and tidy list of subjects (the National Curriculum perhaps), then we really don’t know the half of it. We may not know what they are learning, perhaps we don’t need to, but when children are given the freedom to play in a stimulating environment, and allowed time to develop their play and sustain it for as long as they want, we can be sure they are learning. This is the kind of childhood that I want my children to have, and in this country we are lucky to be able to give our children this freedom. We are also able to choose whether they are educated in school or at home, but it is accepted without question that every child has a right to an education. While I was thinking about this post, I had an interesting conversation with Owl and Monkey. It started with a rant about tidying Lego, and how we should look after our toys as many children don’t have any. We talked about the situation in West Africa, and our involvement (with other bloggers) in the World Vision sponsorship scheme; about how it would feel to be hungry all the time, to work very hard or walk a long way to get a little water or food, and not to have time and energy to play; about how charities are working to provide food for the children who need it, but they need our help. Owl suggested that we should get some of our toys and send them to the children, so we had a discussion about the cost of sending toys to West Africa! Most of us have comfortable homes, warm clothes, enough food and an abundance of toys, books and other possessions. Many children and families in West Africa have very few of these things. We may feel helpless, but in reality we are not. In our own small way we can each make a difference to one child, one family, and collectively we can make a bigger difference by sharing our efforts. This post was written for a blog hop to raise awareness of World Vision’s West Africa Appeal, and the DFID matched funding they are receiving until 30th August. Any amount you are able to donate via the World Vision website will be doubled and will go towards long term projects to help build a better future for the children of West Africa. I am tagging two other bloggers to join in to the blog hop if they wish, to help spread the word. This is a blog hop hosted by Patch of Puddles. This entry was posted in Family life and tagged childhood, lost childhood, play, Share Niger, West Africa, World Vision on July 24, 2012 by Hannah. We’ve been having a quiet week at home so far, with Rabbit off Pre-school with a sickness bug. She’s fine now, and the children have enjoyed extra unstructured time to play together which has been interesting to watch. There has been lots of imaginative play, some good sharing and co-operation, wonderful if messy creativity, and reasonable attempts at clearing up after themselves. I must admit I can’t report exactly what it has all been about. We’ve done some Maths at the start of each day but then I’ve mainly left them to their own devices while I’ve attempted to catch up with housework. In the afternoons, they have been doing Reading Eggs, Mathletics and Spellodrome, and a lot of playing in the garden. The big boys have also been to Beavers this evening and had a tennis lesson which they really enjoyed. Tiddler has been joining in more and more with everything the older ones do – he has even been demanding the right to “do Maths”! His speech has also suddenly moved on again, with lots more sentences now. When daddy left for work one day, he said “I want to go and look out window” and there have been lots more like that. He also tries to join in every conversation, and copies everything he hears. He’s been asking to sing certain songs over and over again, and is obviously trying hard to learn them. He loves “Twinkle Twinkle Little Star”, and joins in loudly with the bits he knows, especially “WHAT YOU ARE”. He also likes “The Wheels on the Bus”, shouting “ALL DAY LONG” with great enthusiasm. The strangest conversation I have had with him today occurred during his evening breastfeed. There has been a lot of debate about extended breastfeeding recently, and I haven’t really commented on it yet. Maybe I’ll do a serious post about it sometime…Anyway, this evening, he kept stopping to tell me something which was very important but I couldn’t understand it at first. It was something about monkeys and dinosaurs outside, and then he started saying “Ribbit ribbit said the frog” which he told me was at Granny’s house. He then said there was a frog and a fox (no doubt about which Granny he was thinking of) and the fox was having breakfast. He carried on feeding for a while and then stopped to tell me that the fox had porridge for breakfast, with honey, and some water. Having communicated this important message, he was happy. I could feel his satisfaction at knowing enough words to be able to tell such a long story. I love this stage of development (I think I say that about every stage!) – it’s so interesting to find out what is going on in their funny little heads. It cheered me up anyway! This entry was posted in Family life and tagged breastfeeding, talking, Tiddler on May 30, 2012 by Hannah. It’s been a mad week, and I haven’t blogged anything that happened after the Museum visit on Tuesday. I can’t remember everything we’ve done, but there are a few bits and pieces I want to record here. On Wednesday, we had a home education group meeting at our house. The children had a lot of fun playing in our overgrown garden, and luckily we managed not to lose any of them among the long grass and rather impressive array of weeds wild flowers we are currently cultivating. Monkey and Owl set up a very good obstacle course and all the children had a go, the older ones helping the younger ones so that they all succeeded in completing it. We had a teepee at the half way point, and I suggested that each child could go in there and either sing a song or count to ten before continuing. I particularly enjoyed listening to Jingle Bells sung very quietly and sweetly by a lovely four-year old boy! After the group left, we went to the Beavers’ Jubilee party and the children had fun playing games and eating lots of cake. 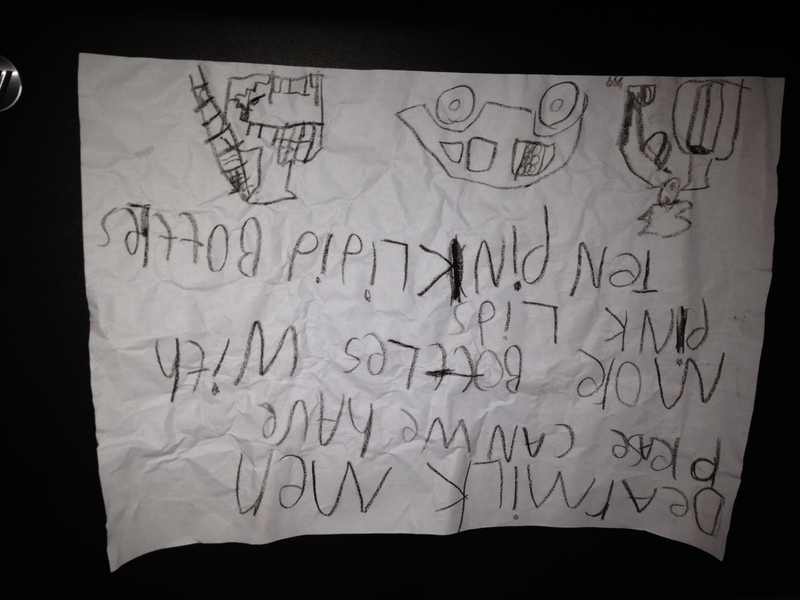 When we came home, Monkey decided he had to write a very important note for the milkman before he could go to bed. I believe this is known as “writing for a purpose”! On Thursday, Granny (my mum) came to visit so we had a peaceful and productive morning. 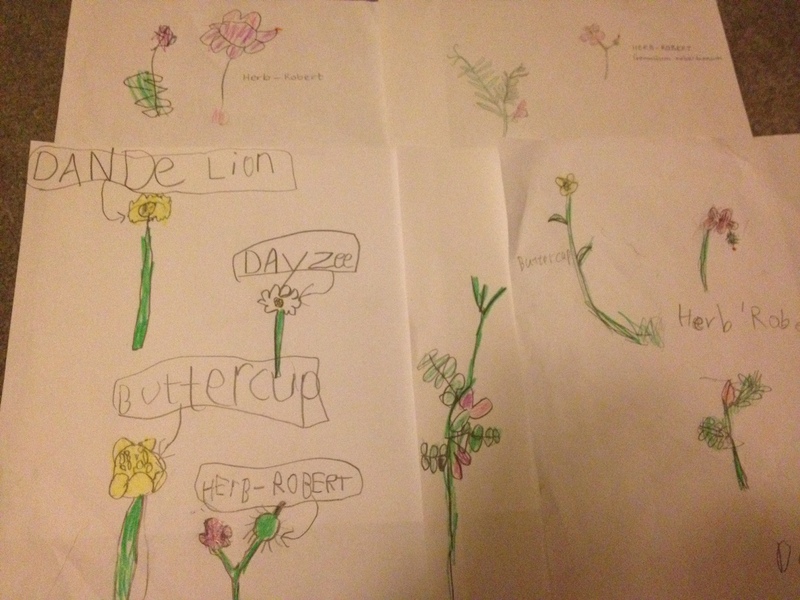 In the afternoon I decided that, instead of fighting against it, I should use the overgrown garden as an educational resource, so we spent a long time drawing wild flowers and trying to identify them. Owl, Monkey and Rabbit all did some really good drawings, and I thoroughly enjoyed doing it with them. On Friday, the other Granny (I need some granny code names…) came to take Owl for his violin lesson, and afterwards she looked after Owl and Monkey while Rabbit was at pre-school and I took Tiddler to his Musicbox class, which he loves. Grannies may not be essential requirements for home educating, but they certainly make it easier! Later in the day, the boys continued writing their Lego stories and worked on their Prehistory project a little. Owl and Rabbit did reading eggs, and they all played in the garden a lot. Today I took Rabbit and Tiddler to Dramabuds, and Suburban dad took Owl and Monkey to football. Then they all had their haircut, before the big boys went to another Beavers and Cubs Jubilee party. Rabbit painted a box for some treasure that she had collected on the way home from Dramabuds (sticks, leaves and a stone! ), before going to her ballet lesson. She then spent the rest of the day playing in our new train paddling pool, joined by Tiddler after his sleep. I pottered around for a bit trying to do some domestic tasks, before admitting defeat and joining in with them. I pulled up a chair and sat with my feet in the pool, and for a while the two of them did the same with their little chairs, which was very sweet. It took a long time for Tiddler to decide to get in but he did in the end. Rabbit was in and out constantly, jumping and splashing so we all got quite wet anyway! They also spent a long time playing with the plastic balls that came with the pool (we have loads already, but there’s nothing quite so exciting as new stuff!) When the big boys finally returned home, we had a rather late but very nice supper in the garden – although the boys had taken a packed tea with them, we guessed they would be hungry enough for a cooked meal, and they certainly were! Banana smoothies for pudding went down well too. This entry was posted in Family life, Home education and tagged ballet, Dramabuds, drawing, football, obstacle course, writing on May 26, 2012 by Hannah. I’ve been thinking about lists and how they reflect priorities. I suspect I’m not alone in having lots of to do lists on the go (some make it to paper, and some are just in my head! ), and my mood at the end of each day is often related to how much or little of these have been ticked off. Today, for example… a low score on domestic tasks. Mainly just clearing up in the kitchen, and a bit of tidying up which was partially undone by Tiddler. Suburban dad has done better on his list of DIY tasks. He has been putting up shelves all over the place, which should help us in the war against clutter. Of course, his success is partly the reason why I’ve done so little, as I was mainly keeping the children busy and out of his way. Have I played with my children today? Have I read to them, listened to them read or looked at a book with them? Have I listened – really listened – to what they have to say? Have I looked in to their eyes and given them my full attention? Have I told them I love them? praised them? said that I enjoyed something we did together? Today, I think I have done just about all of them, but not necessarily each thing on the list with each child. It’s challenging with four, but not impossible. So today, all in all, has been a good day… but I think I can do better. I think I need to judge the success of each day less on the other lists and more on this one. This entry was posted in Family life and tagged activities, lists, priorities on May 19, 2012 by Hannah.